Replace ScriptManager with RadScriptManager replaces the default ScriptManager component that is added for AJAX-enabled Web sites with RadScriptManager. The Skin drop-down lets you select from a list of available skins to customize the look of your RadUpload control. Links navigate you directly to RadUpload examples, help, or code library. You can also search the Telerik web site for a given string. 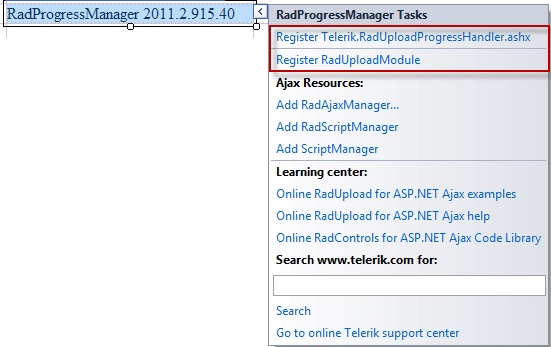 As of 2008 Q3 SP1 (2008.3.1125), RadProgressManager can automatically register the RadUploadHttpModule and RadUploadProgressHandler in the web.config file. The RadProgressArea Smart Tag is exactly the same as the RadUpload Smart Tag. The Skin drop-down is available so that you can choose a skin for the progress dialog that it displays.